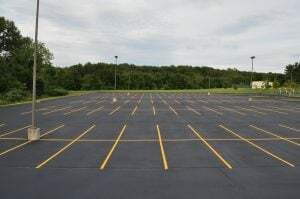 While fresh parking lot paint goes a long way in giving your property that clean, and organized look, professional parking lot striping involves a lot more than aesthetics. 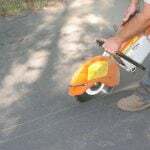 There are several regulations and specifications to consider when striping your lot, and line striping procedures may vary per location based on ADA (Americans with Disabilities Act) regulations. Along with ADA regulations, there are also several other things to consider when painting parking stripes. Features of accessible parking spaces like an access aisle. This access aisle must also meet ADA regulations. Meeting all ADA and zoning regulations is key in making sure that your building is up to code. 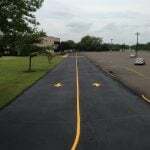 Trusting in an expert parking lot striping professional to know the specific regulations for your area and type of building is recommended, considering the complexity and importance of the job. 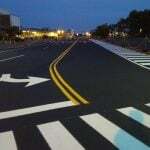 Professional line striping creates structure, safety, curb appeal, and a parking lot that meets ADA regulations. As a property owner, you are responsible for maintaining your lot, to not only maintain your property’s value, but also to provide safety. Having a safer parking lot means that your chances of being liable for damages or injuries is significantly lowered. If regulations and specifications are not met, issues like towed vehicles, limited sidewalk access, fire department issues, and accidents can occur. If parking stripes are extremely warn, this creates the potential for parkers to incur fines like parking in a handicap spot because they could not see the marking. The parker will likely seek damages from the property owner for not keeping the lot maintained. The compensations and residual issues that can result from these damages can be significantly costlier, and more than just financially, than parking lot maintenance would have been. 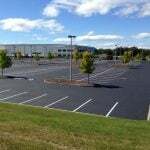 When it comes to parking lot striping, it is more than just straight lines. 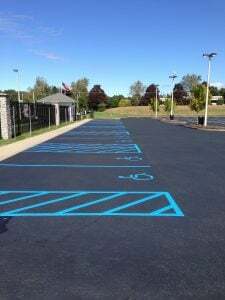 Call the professionals at EastCoat Pavement today to get your free estimate and make sure your parking lot lines are not only straight and look great, but also meet all necessary regulations!